Inverted cable connectors and couplings are the solution for reliable cable-to-cable connections in building, industrial and outdoor applications. Modular basic housings and contact inserts also make angled conductor outlets possible for the first time. The housings are available in different versions for 0°, 45° and 90° exit angles and can be equipped with contact inserts for socket or pin contacts depending on the application. The inverted connectors and contact inserts are available in three- or five-position versions and offer a high degree of protection up to IP69K. 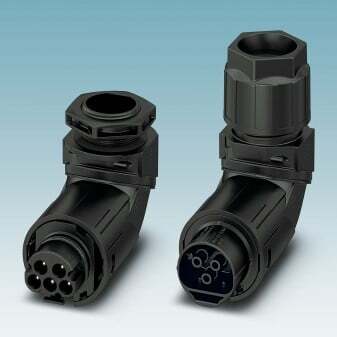 The circular connectors are designed for currents up to 35 A and voltages up to 690 V AC (III/2), and are up to 75 percent more compact than conventional industrial connectors. Thanks to the weatherproof materials, they are also suitable for indoor and outdoor use.